A Campbeltown man who drove dangerously through Connel while under the influence of alcohol has been banned from driving. Gordon McShannon, of 62 Milknowe, Campbeltown, previously pleaded guilty to driving dangerously on the A85 at Connel on February 24 of this year by failing to observe an oncoming vehicle and driving into its path, causing it to take evasive action. The 67-year-old also admitted to being almost four times over the drink driving limit. He had 86 microgrammes of alcohol in 100 milliliters of breath, when the legal limit is 22 mg in 100 ml. 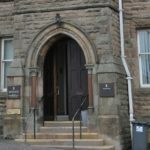 He was sentenced on Wednesday April 10 at Oban Sheriff Court. Sheriff Hughes gave McShannon a £1,000 fine – £500 for each of the offences, and disqualified him from driving for 16 months. However, his solicitor Kevin McGinnes said it was unlikely that he would drive again.